✔ The 4M Weather Station Kit has an anemometer, thermometer, rain gauge and more. ✔ Kids collect data about the weather on a notebook and analyze it. ✔ They become interested in the weather and science. ✔ Extra worksheets available online for free. The 4M Weather Station Kit is a weather station designed for kids ages 8 and up. It includes an anemometer, a thermometer, a wind vane and a rain gauge. With this fun kit, kids keep track of the temperature, wind direction, wind levels and amount of rainfall. They also use a notebook to do all this tracking on a daily basis, just like scientists do. What is great about this toy is that it teaches kids not only about the climate but also about the scientific approach: by collecting data on the weather, kids analyze it in order to determine trends, patterns correlations, and draw conclusions. For example, they could determine that there is an increase in wind speed before a heavy rain. Or they could find a negative correlation between wind speed and temperature. 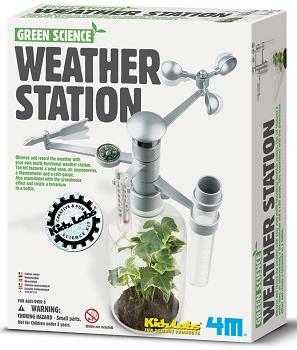 The weather kit also teaches kids about the green house effect. A little cup is provided that kids use to grow a plant. An instruction book with lots of helpful information about meteorology and the weather is also provided. There are also weather worksheets that are available online for free. The toy is cheap therefore one should not except to receive a sophisticated home weather station. However, it does achieve its objective of teaching children about the climate and the science behind the weather. You can later move on to more sophisticated and expensive weather stations. 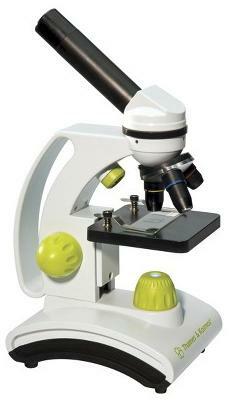 Overall, this toy is a great way for kids gain an interest in the weather, physics and science in general. If your child is interested in the weather, we also recommend a book called The Kids' Book of Weather Forecasting (for ages 7 and up). The book contains information and activities related to the weather and weather forecasting. The book was written by senior meteorologist Mark Breen and it received an award from the American Meteorological Society. By the way, we also recommend that you visit our page with science projects for kids, which includes projects such as tracking the rain fall and making a barometer.